In 1963 Marvel Comics was riding an unprecedented wave of sustained success with series such as The Fantastic Four, The Amazing Spider-Man, and The Uncanny X-Men, two of which featured superhero teams. But rival publisher DC Comics (coyly referred to by Marvel writer/editor Stan Lee as “the Distinguished Competition”) had already struck pay dirt three years earlier with Justice League of America, which presented the company’s best-selling heroes operating together as a crime-fighting team. Marvel’s initial response to the Justice League of America (JLA) had been 1961’s The Fantastic Four, which consisted of heroes created from whole cloth (with the exception of a second-generation Human Torch), because Marvel had no preexisting heroes then capable of competing with the likes of DC’s Superman, Batman, Wonder Woman, the Flash, and Green Lantern. A mere two years later, the publishing landscape had changed considerably in Marvel’s favor, enabling Lee and artist Jack Kirby to assemble enough successful Marvel headliners to form a supergroup title in the JLA mold with The Avengers (whose first issue bore a September 1963 cover date). The Avengers, however, was anything but a carbon copy of Justice League of America, whose members exhibited a stilted uniformity, at times seeming almost interchangeable. Marvel’s new team not only showed real diversity, but also owed its existence largely to the machinations of a villain. Loki, the Norse god of evil, maneuvers his half-brother, the thunder god Thor (from the pages of Journey into Mystery), into a battle against the Hulk (whose first six-issue Incredible Hulk series had concluded with the March 1963 issue). This fracas also attracts the attention of Iron Man (who debuted in March 1963’s Tales of Suspense #39), Ant-Man, and his crime-fighting partner and paramour, the Wasp (both of whom maintained an address in Tales to Astonish). Although this ad hoc quartet at first believes the Hulk to be the villain responsible for an act of railway sabotage, Loki quickly emerges as the real culprit, and suffers a decisive defeat. Before the heroes disperse to their respective titles, Ant-Man suggests that they make their association a permanent one, and the Avengers (a name suggested by the Wasp) is born. Even the notably antisocial Hulk agrees to become part of this new crime-fighting quintet, hoping that by keeping such heroic company he will discourage the military from continually hounding him. In the mastheads of many Avengers stories of the 1970s, the group’s origin and subsequent history are aptly encapsulated: “And there came a day unlike any other, when Earth’s mightiest heroes and heroines found themselves united against a common threat! On that day, the Avengers were born—to fight the foes no single super hero could withstand! Through the years, their roster has prospered, changing many times, but their glory has never been denied! Heed the call, then—for now, the Avengers Assemble!” Indeed, the aforementioned roster changes begin almost immediately, with the departure of the Hulk (The Avengers #2, 1963), and the induction of Captain America after his recovery from the block of ice in which he had been frozen since the end of the World War II (issue #4, 1964). Captain America (whose 1950s incarnation is conveniently ignored) suffers tremendous angst because of his displacement in time and ago nizes over the wartime death of his kid sidekick Bucky Barnes; this poignant characterization, and the contrast between Cap’s steadfast patriotism and the hot-headedness of some of his younger teammates, swiftly become two of the group’s essential dramatic foci—as does the return of the Nazi Baron Zemo, Captain America’s arch-foe, and his Masters of Evil, a collection of superpowered opponents already familiar to the other Avengers. The Avengers distinguished itself from Justice League of America in another important respect: It questioned the idea of heroism itself. While the JLA members were all unambiguous good guys— so much so that they were virtually indistinguishable from one another, except by their costumes—more than a few Avengers started their careers on the wrong side of the thin spandex line that separates hero from villain. When Thor, Giant-Man (the former Ant-Man, who would later change his name again to Goliath), and the Wasp simultaneously leave the team, Captain America finds himself heading a new squad of Avengers: Hawkeye, an accomplished archer in the mold of DC’s Green Arrow; Quicksilver, a mutant speedster reminiscent of DC’s Flash; and the Scarlet Witch (Quicksilver’s sister), a young woman with the power to alter probabilities using an inborn “hex power,” thus making seemingly impossible things occur when necessary. The recruitment of these characters was a daring editorial choice, and would have been unheard of in a staid organization like the Justice League. Hawkeye, after all, had formerly been a super-criminal, a part of Iron Man’s rogues’ gallery (Tales of Suspense #57, 1964); Quicksilver and the Scarlet Witch had been (reluctant) members of the self-described Brotherhood of Evil Mutants, a group headed by their father Magneto (X-Men vol. 1 #4, 1964). This development helped foster a sense that anything was possible in the burgeoning Marvel universe—the feeling that all human beings possess capacities for both good and evil—and that no one is beyond redemption. This notion is reinforced years later when Wonder Man (introduced as a villain in The Avengers #9) returns from the dead as a hero and takes his place in the Avengers’ ranks (The Avengers #151, 1976). Adding further realism and ambiguity to the mix is the fact that not every superhero desires Avengers membership; when the team extends an invitation to Spider-Man (The Avengers #11, 1964), he declines it. Reflecting the rise of feminism in the 1970s, the Wasp would return to the group, eventually becoming a competent Avengers leader and putting to rest her early 1960s airhead persona. From its inception The Avengers was a hit, and the series’ initial success doubtless owes much to the power-packed, sui generis renderings of Kirby, who had not only co-created Captain America with writer Joe Simon in 1941, but had also collaborated with Lee on such Marvel mainstay titles as The Fantastic Four, The Incredible Hulk, and Journey into Mystery (featuring Thor). Kirby illustrated The Avengers throughout its first year. With issue #9 (September 1964), Iron Man artist Don Heck (from Tales of Suspense) ably took over the penciling reins (though Kirby filled in as penciler on issues #14-#16, and did the page layouts for other second-year Avengers issues), while Lee continued with the writing chores until he handed the series off to Roy Thomas (issue #35, December 1966). Over the next several years, Thomas worked with such notable Marvel artists as the aforementioned Heck, John Buscema, George Tuska, Gene Colan, Barry Smith, Sal Buscema, Frank Giacoia, Rich Buckler, and Neal Adams, whose brief run on the title in 1971 (issues #93-#96), during the war between the galactic empires of the Skrulls and the Kree (alien races created by Lee and Kirby and first seen in The Fantastic Four), is widely regarded as among the finest Avengers work ever done. Under Thomas’ direction (with writing assists from noted fantasist Harlan Ellison in issues #88  and #101 ), Avengers story arcs became increasingly complex and character-oriented, flowering into a superpowered melodrama of operatic proportions. Among the many notable characters introduced during Thomas’ tenure are such team members as the Vision (an emotionally tortured android with optic-blast powers and the ability to make himself intangible), and such villains as the Grim Reaper (the vengeance-crazed brother of Wonder Man), and Ultron (a world-conquering robot who sought to destroy his creator, Henry Pym, the former Ant-Man). Thomas left the series after issue #104 (1972), to be succeeded by Steve Englehart (author of a seminal time-travel arc involving the villain Kang the Conqueror and his time-displaced doppelgangers Rama-Tut and Immortus), Gerry Conway, Jim Shooter (Conway’s and Shooter’s Avengers runs are also distinguished by the stunning and highly detailed artwork of George Pérez), Steve Gerber, Tom DeFalco (a future Marvel editor-in-chief), David Michelinie, Mark Gruenwald, Steven Grant, Roger Stern, Bill Mantlo, and John Byrne. During the 1970s and 1980s, the Avengers’ membership roles would turnover completely several times while growing exponentially (despite orders from Marvel’s fictitious federal government that the group be downsized dramatically in 1979), encompassing such major and minor Marvel heroes as the Beast (from X-Men), the Black Panther, Starfox, Hellcat (Patsy Walker), Mantis (Englehart’s “Celestial Madonna,” whose destiny was to give birth to the most powerful being in the universe), the Black Knight, the She-Hulk, the Sub-Mariner, Tigra, the Black Widow, and even the nineteenth-century Western hero known as the Two-Gun Kid. This relentless expansion isn’t surprising, however, given the special government security-clearance status and the weekly thousand-dollar salary (courtesy of Iron Man’s Stark International munitions firm) afforded to members by the late 1970s. By the 1990s all the original members of the Fantastic Four—and even the chronic non-joiner, Spider-Man—had become either reserve or inactive Avengers. By the mid-1980s, the New York-based team had grown to such unwieldy proportions— despite the inactive status of most members— that a second squad was formed in Los Angeles, under the initial leadership of Hawkeye (1984’s West Coast Avengers limited series, and the ongoing West Coast Avengers [later Avengers West Coast] monthly series, which ran from 1985 to 1994). In 1989 a self-styled “wannabe” team known as the Great Lakes Avengers—consisting of oddball, previously unknown fourth-stringers such as Mr. Immortal, Dinah Soar, Big Bertha, Flat Man, and Doorman—came into being (West Coast Avengers #46), but never achieved official standing with either of the bicoastal teams. 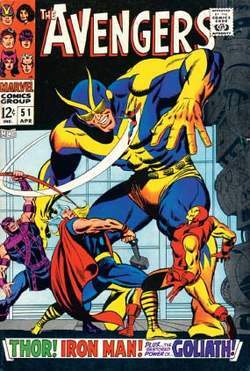 In late 1995 Marvel released Last Avengers, a two-issue series (written by Peter David and drawn by Ariel Olivetti) that put an end to many decades-long continuity arcs, and boasts a high Avengers body count, killing off Captain America, Thor, Hercules, the Vision, the Scarlet Witch, and others. But this was far from the end of the line for the Avengers, who resurfaced in the latest volume of their ongoing saga in February 1998 (The Avengers vol. 3). From that point fan-favorite writer and Silver Age (1956–1969) scholar Kurt Busiek (who made his reputation penning 1994’s superb, Alex Ross-illustrated Marvels miniseries) chronicled most of the team’s adventures in its main title for four years, collaborating with artists such as George Pérez, Carlos Pacheco, Jerry Ordway, Stuart Immonen, Norm Breyfogle, Richard Howell, Mark Bagley, John Romita Jr., Steve Epting, Alan Davis, Manuel Garcia, Brent Anderson, Ivan Reis, Kieron Dwyer, Patrick Zircher, and Yanick Paquette before leaving the series in the hands of writer Geoff Johns in October 2002 with Avengers vol. 3 #57 (writer Chuck Austen took over in vol. 3 #77, March 2004). The 1990s was also replete with Avengers miniseries and other ancillary titles executed by various creative teams, including the hugely popular, time-spanning Avengers Forever (1999). In 2002, writer Mark Millar and artist Bryan Hitch collaborated on an alternately grim and satirical reinvention of the series for Marvel’s “Ultimate” line, suitably retitled The Ultimates, which immediately became one of comics’ best-selling and most critically acclaimed series. Also in the new millennium, Busiek and Pérez teamed up to create the long-awaited JLA/Avengers intercompany crossover miniseries (2003), which after two decades of false starts finally brings the Avengers together with the DC Comics superteam that inspired it in the first place. During Marvel’s “Civil War” there were two rival teams of Avengers. Iron Man organized the official team, the Mighty Avengers, who supported and enforced the new Superhuman Registration Act. In contrast, the New Avengers were an underground team of heroes who opposed the Superhuman Registration Act, and included Luke Cage, Spider-Man, and Wolverine as members. Later, Norman Osborn, the original Green Goblin, became a high government official and organized his own “Dark Avengers,” including disguised supervillains. After Osborn fell from power, there was again one Avengers team, including the new Captain America (Bucky Barnes), Hawkeye, Iron Man, Spider-Man, Spider-Woman, Thor, and Wolverine. A young team of superheroes banded together in the new Young Avengers series that debuted in 2005. Avengers Academy, which debuted in 2010, is about the Avengers’ new school for training young superhumans. Secret Avengers, which also launched in 2010, features an additional team of Avengers—founded by Steve Rogers, the original Captain America—to go on covert missions. But the Nautilus was rising slowly to the surface of the sea, and the form of the Avenger disappeared by degrees from my sight. de Villefort, send for the priest; I will be the avenger. As the time approached I should have liked to run away, but the Avenger pursuant to orders was in the hall, and presently I heard Joe on the staircase. Speak not of vengeance, husband," she answered, "I, too, am near to that land where the Slayer and the Slain, the Shedder of Blood and the Avenger of Blood are lost in the same darkness. The Greek Slave, or Constantine the Avenger, is the name of this thrilling drama. Avengers (1-0) update: Brian Mann will get his second consecutive start at quarterback after leading the Avengers to a 40-31 season-opening win over Arizona at Staples Center last week.